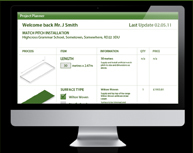 Register online to use our project planner. The Powerplay Instant Cricket System opens up incredible opportunities for coaching and recreational matchplay on almost any existing artificial turf surface or gym floor. PowerPlay is a patent pending product which acts just like a natural cricket strip. It can be rolled out in just five minutes and provides realistic bounce and spin and seam reaction. The pioneering design features stabilising strips so that the mat lies flat. The system also includes a special trolley to ensure the surface retains its shape and performance characteristics between games and makes it easy to move, install and store. The Powerplay Instant Cricket System is a fantastic new way to encourage people of all ages to discover and enjoy cricket, and is particularly useful in urban environments and where traditional cricket pitches aren’t feasible. A unique shockpad design to help regulate the ball bounce. Built in expansion ports to enable the system to absorb temperature variations. Stabilising strips to ensure the mat lies flat. Durable surface offering a long lifespan, player comfort and underfoot grip. The PowerPlay is ideal for schools and clubs unable to install a permanent artificial strip. Turn almost any existing astroturf pitch into a cricket field with this revolutionary matting system! The Powerplay System comes complete with trolley and can be simply rolled out and installed in 5 minutes. So whether you want to earn extra income from your synthetic pitch or are a club or school with access to an all weather area this is the perfect solution for both coaching and recreational match play.